Last year at CES, Casio introduced their first Android Wear watch, a $500 outdoor-focused wearable for the extreme crowd. Unfortunately, it lacked one of the most important pieces of outdoor tech, a GPS, leaving many of us scratching our heads. This year, Casio is back with the next version, and yep, it has GPS. 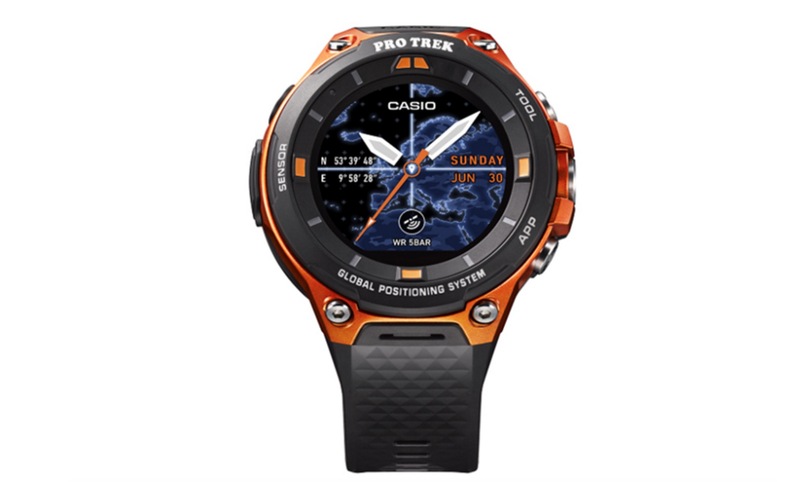 The new Casio watch has at least three names that I can tell, the WSD-F20, Smart Outdoor Watch, and PRO TREK Smart. I’ll let you decide which you want to go with, but overall, the watch looks promising in a time where few are making Android Wear watches. It will come in either orange or black colorways. The WSD-F20 sports a low-power GPS, 1.32-inch dual-layer LCD display, 50 meter water resistance, MIL-STD-810 environmental durability, pressure sensors, Bluetooth 4.1, WiFi, and Android Wear 2.0 (when it launches). As for software features, you’ll get special location tracking, activity monitoring, and the ability to measure altitude and air pressure, while also having access to a compass, sunrise/sunset times, tide graph, and more. You’ll even get specially designed watch faces and two hiking apps with GPS. Casio didn’t reveal pricing, but did say to expect the watch in April. To learn more, head over to Casio’s site.